James Neiss/staff photographerNiagara Falls, NY - Upper Mountain Volunteer Fire Company Engine Captain John Schults drops a package containing an egg made by Lewiston Porter students Justin Raymond, left, and Kenny Holmes, right, in the Design & Drawing for Production class. 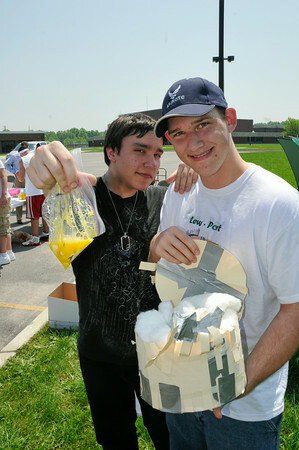 The students were instructed to build a container that would keep an egg from breaking when dropped from 100 feet. Six out of fourteen eggs survived the fall, Raymond and Holmes were part of the unlucky group.